At least I assume they do. 12 months ago after subscribing to their home media package (phone, TV and wifi), I started receiving letters through the post from Virgin Mobile trying to sell me a new mobile phone contract. I hadn't answered any questions or filled anything in as part of my sign up to Virgin Media to a) suggest I was interested or b) to indicate I needed a new phone contract. But hey, they sent them anyway. Regularly. 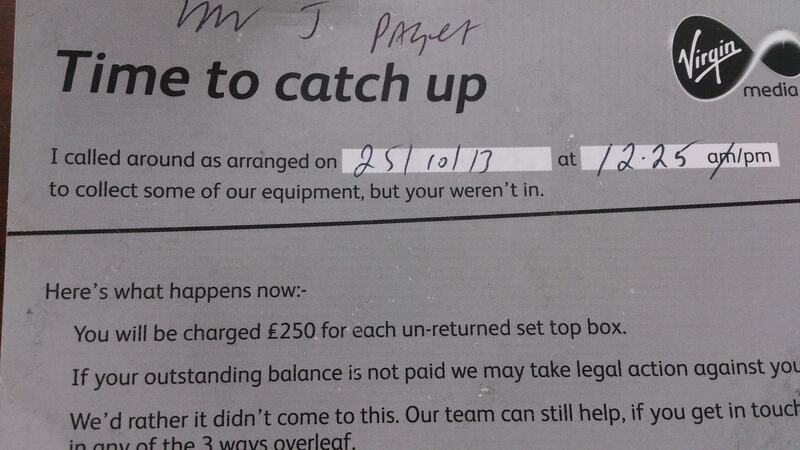 More recently I cancelled my Virgin Media package and notified them of the date we were moving out. They told me they would send boxes for me to post back the set top box and router and we agreed the date the services would be cut off. However, before the boxes even arrived I started receiving letters through the post addressed to 'the new homeowner'. 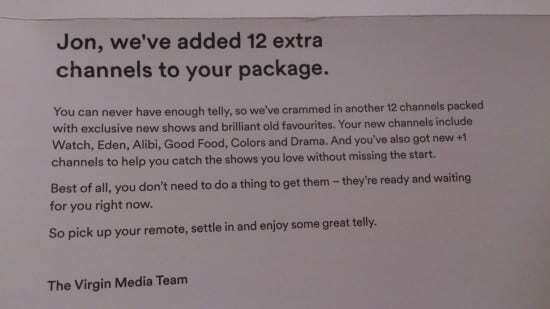 Intrigued I opened one, to find that Virgin Media were trying to sell the media plan I'd been signed up to, to the new people moving in to the flat. Now, ignoring the fact that I wasn't the homeowner (and therefore neither would the new tenant moving in after me), they'd got their dates wrong even though I'd told them when we were moving out. They sent several letters in quick succession, all before I'd moved out or new tenants had moved in. What's also obvious is that if these errors are being replicated elsewhere (and I've no reason to suggest they wouldn't be) the results of these campaigns can't be very good. And, if they bothered to look at the results, they'd probably decide the campaign wasn't working. But, this would be almost entirely (in my case at least) down to the implementation of the campaign and not the campaign (concept) itself. 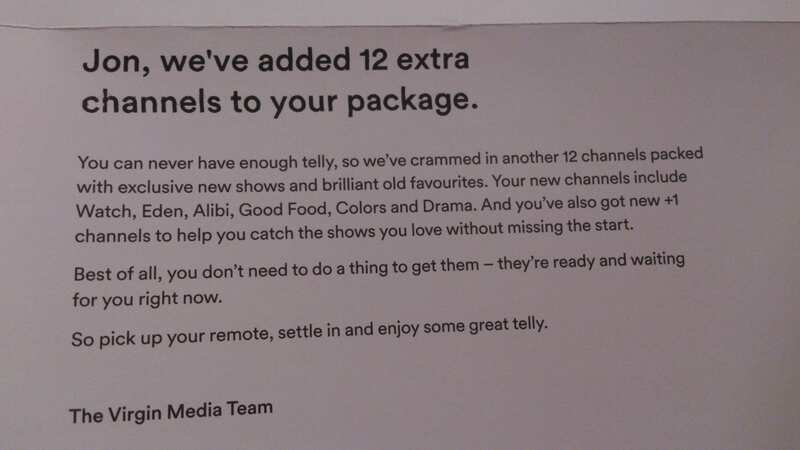 If Virgin Media really were keen on customer acquisition, surely they would think of a better way to reach out to the new prospective customers. Perhaps requesting everything be left in place if a current customer was moving address from a rented property or leaving the account open at the address, so new customers could be set up with TV and broadband in a much shorter time frame. If Virgin considered the pain points for customers moving house, they would know that people hate waiting 2 weeks for installation, especially for wifi. Solve this and they have a USP (of sorts). They could of course also make it much more enticing for me, the current customer, to move flat and take my Virgin service with me (as opposed to charging me a new installation fee and renewing the 12 month contract). Yes, this would incur additional costs but think of the improvement to their customer retention rates! What can we learn from Virgin Media? 1. CRM can be as simple or as complex as marketers want it to be. However having clever, multi-wave CRM campaigns rely on having 100% accuracy in their execution. Otherwise the above mess can result all too easily. The outcome of all of this is a negative impact on a customer (i.e. me) who was, up to recently, a relatively satisfied customer. Who knows, I might have got to my new address and signed back up with Virgin Media (there wasn't an incentive to carry over my service so I took the more flexible option). And in case you're wondering, I have since gone with BT. In order to deliver this, brands will need tight control of their CRM and customer data or it's not going to happen. 3. Personalisation done badly just won't wash. The days of having our name mail merged into the top of a letter or email and it feeling personal are long gone (if they ever really existed at all).